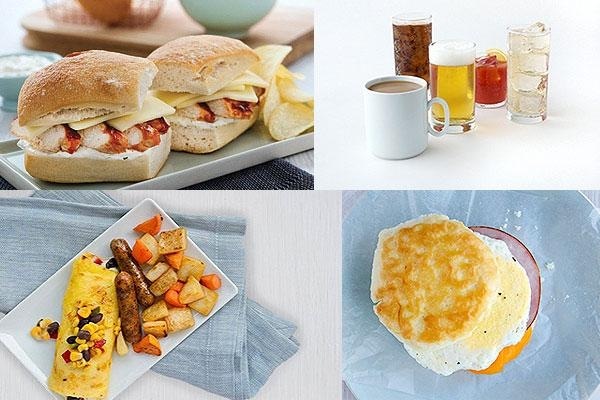 United Airlines is now offering several new dining, snacking and beverage options in its Choice Menu including egg and chicken chorizo tacos for breakfast and a barbecue chicken sandwich for lunch and dinner. On United’s premium transcontinental flights between Los Angeles and New York/Newark and between San Francisco and Boston and San Francisco and New York/Newark, customers will also enjoy new dessert and beverage selections. United will also become the first airline to offer Stella Artois aboard domestic and international flights this summer. United is excited to announce the launch of egg and chicken chorizo tacos, a delicious new breakfast offering inspired by the exciting street food and food truck trends across the country. The tacos were in development for more than a year as the airline worked to create an authentic tasting breakfast taco. Using input from more than 800 customers and flight attendants – who sampled different recipe variations – the egg and chicken chorizo taco was the clear winner with taste-testers enjoying the taco’s spicy, yet subtle, chorizo flavor. The order of two (2) egg and chicken chorizo tacos features scrambled eggs, chicken chorizo, made with a mix of Monterey Jack and Swiss American cheeses, charred chipotle salsa and chives, served on corn and flour tortillas. For lunch/dinner United is introducing a new barbecue chicken sandwich that features pulled smoked chicken, barbecue sauce, cheddar jack cheese and a dill pickle plank served on a focaccia roll. Lagunitas Sumpin’ Easy Ale is now available onboard along with a new craft IPA from New Belgium, the Citradelic Tangerine IPA. The new offerings have been added in response to ongoing customer interest in craft style beers offered by some of the top microbreweries in the U.S.
Stella Artois, the well-known Belgian pilsner, will be available in a can on domestic and international flights beginning this summer. United will be the first airline to feature Stella Artois on its flights, which is one of the world’s best-selling beers and is enjoyed in more than 80 countries. Customers seated in United Business can enjoy Ghirardelli sundae toppings on premium transcontinental flights. The toppings include Barista Dark Chocolate Mini Chips, Ghirardelli Hot Fudge sauce, Ghirardelli Caramel sauce and Barista Caramel Flavored Mini Chips. A new signature cocktail – the Old Fashioned – made with whiskey and bitters and served with a classic orange rind garnish is also now an item offered on United’s premium transcontinental service. The Old Fashioned will also be complimentary in United Economy Plus and available for purchase in domestic Economy.